With today's high performance motorcycles, it is crucially important to make sure they are properly serviced, particularly if they've been hidden in the garage during any season. 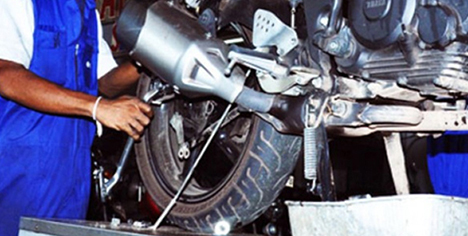 This is not only to ensure that the bike is running safely but also to make certain that the fluids and calibration of the motorbike are setup in a way that reduces wear and prolongs the life of your motorbike. Depending on your bike and usage, we have a range of servicing options to suit which are summarised below. We undertake following services for bike Repair. Corporate Vehicle Maintenance. Example Pizza Hut / Mac Donalds , Blue dart etc..
Incase of your vehicle being damaged or can not be repaired on site ; we will also assist you with Towing service. The additional cost for towing would be applicable as per actual. Pick up & Drop Service available for clients who need repair & service for their bikes. © 2017 Super Sure Services . All Rights Reserved.